Solving world hunger . . it’s no small topic to broach in the lead-up to Christmas but you can be thankful the issue has not been addressed by me but by Ronni Kahn, CEO and Founder OzHarvest, Australia’s leading food rescue organisation. Ronni is, of course, the Founder and CEO of OzHarvest; she is strong-willed, single-minded and extraordinary. Ronni set up OzHarvest a decade ago and today there are 28 vans tootling about each capital city in Australia feeding people who would have once gone hungry. 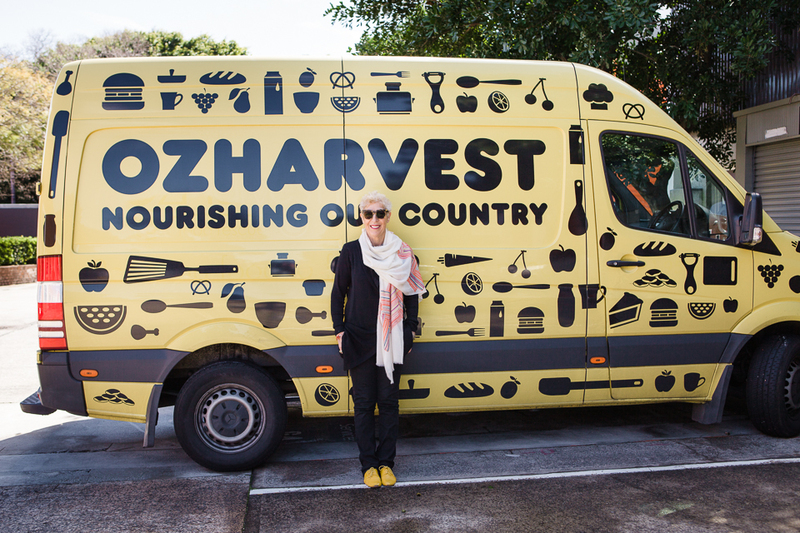 But OzHarvest, and Ronni, are becoming much more than just a pick-up service for leftover food. They are leading the charge on food waste – a $10billion waste in Australia alone. It’s a proper disgrace. And yes, I am honoured to sit on the Board of OzHarvest. On one hand, nearly one-third of the world’s food production goes to waste each year. That’s some 1.3 billion tonnes of fruits, vegetables, cereals, meats and dairy products lost or wasted instead of being eaten according to the UN Food and Agriculture Organisation. On the other hand, 870 million people across the globe are undernourished and without access to food. Skip to Australia. OzHarvest, as part of our Education pillar (the other pillars being Rescue and Engage), repeats this fact year on year, that $8-10 billion of food is wasted in Australia every year. That’s 4 million tonnes of food that ends up in landfill. Think of the staggering amounts of squandered water, energy, fuel and labour used to produce those products. Horrendous for a country with a modest population of 23 million. The terrifying reality is that 2.5 million of our fellow Australians actually live in poverty according to the latest ACOSS report released this year, and rely on assistance and food relief services such as those provided by OzHarvest, FoodBank and similar organisations to get by. Without the basics of food and water, how can one survive? This is what connects all humans. It’s also what provides a person with dignity and respect. It is our basic human rights. It’s also why some experts say food security and food sustainability are two of the most important issues necessary to solve in our lifetime. I bring your attention to some of the global challenges that we at OzHarvest like to get our hands dirty with, and have a go at contributing our innovative thinking and solutions towards. The global issue of food waste, food security, and how to feed a growing world population which will exceed 9 billion by mid-Century. Another is Climate Change. It’s real. It sure is. Believe it or not, food waste contributes significantly to Climate Change. So if you’ve ever wasted the weekend’s leftover spag bol that you just couldn’t bring yourself to eating on Monday morning, or threw away a banana because it’s too brown and bruised…. we’re all a little guilty aren’t we? Every kilo of food wasted or lost that ends up in landfill, rots and creates methane which is 20 times more harmful a greenhouse gas than carbon dioxide. As the United Nations Environment Programme (UNEP) points out, if food waste were a country, it would be the third highest GHG emitter after the USA and China. Scary fact. It’s exactly these issues that see OzHarvest invited by our international partners UNEP and Climate Action, to bring our decade of experience, learnings and knowledge – and proven track record – to activate a food waste themed educational, informative and interactive lunch event for 350+ delegates as part of the Sustainable Innovation Forum at COP20 Lima. The Sustainable Innovation Forum brings together world leaders, CEOs, senior executives, national, regional and city leaders, investors and industry experts to share ideas and accelerate innovative solutions to address climate change, accelerate green growth and sustainable development. It’s with pride and honour that our somewhat small actions at OzHarvest, in having saved 10 million kilos of food from landfill to date, and delivering 30 million meals to hungry Australians have left a huge positive impact on our environment and social world and continue to make an impact as we share our model and legacy with other countries. I hope this encourages you all to think about what you too can do, to make a small contribution in your own way, to help solve hunger, reduce food waste and make a positive impact to addressing Climate Change which will affect each and every one of us , if not now, in some time in the not too distant future. Help us make the small changes necessary to make a huge difference. Subscribe by email for updates! I am a 44 year-old male based in Sydney. I have a top wife, two kids and a job at Liquid Ideas, a PR agency I founded in 2000 that goes from strength to strength despite my best efforts to derail it. I have interests in sport, politics, wine, beer, food, sport and modern interpretive dance. I used to be a journalist and I really miss writing so this seemed a good idea. Australian manufacturing has a future. It’s called craft. Blogged in translation . . .